Skinner's Field & Trial Light & Senior Dog Food is a specially formulated diet for dogs that are overweight, prone to weight gain or have slower metabolisms through ageing. The food contains carefully selected ingredients to assist weight maintenance, including chicken meat meal, naked oats, sunflower oil and linseed, providing a complete and nutritionally balanced diet. Whilst the unique formula has a low calorie content, no compromise is made on quality, texture or taste and the combination of digestible proteins, fibres and vitamins provides a palatable and nutritious diet your dog is guaranteed to enjoy. The wheat gluten-free recipe is great for dogs with sensitive digestions, reducing the risk of exacerbating allergies or stomach upsets. Maize, naked oats, chicken meat meal, rice, beet pulp, white fish meal, whole egg, brewer's yeast, sunflower oil, vitamins, minerals and trace elements, whole linseed. Vitamin A 14,000 iu, Vitamin D3 2,300 iu, Vitamin E (as alpha-tocopherol acetate) 200 iu. Iron (as ferrous sulphate monohydrate) 10mg, Iodine (as calcium iodate anhydrous) 1.5mg, Copper (as cupric sulphate pentahydrate) 7mg, Manganese (as manganous oxide) 30mg, Zinc (as zinc oxide) 70mg (as zinc chelate of amino acids hydrate) 30mg, Selenium (as organic selenium saccharomyces cerevisiae) 0.1mg. Contains tocopherol rich extracts of natural origin (Vitamin E) as EC permitted antioxidant. 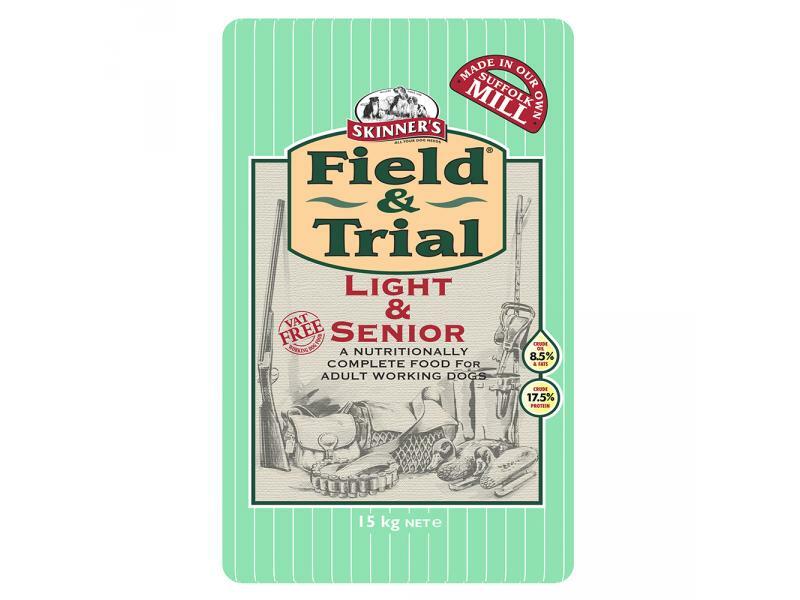 There are currently no questions for Skinner's Field & Trial Light & Senior Dog Food - be the first to ask one!